"Caracas and most of the country continues largely as normal," Koerner told Sputnik. "Just people going about their daily lives, you know, going to market, shopping for some products, children going to school, et cetera. There really has not been any interruption whatsoever, and Juan Guaido remains largely a virtual presence, reappearing every once in a while to call and remind opposition forces to try and overthrow the government, but having no capacity whatsoever to make that a reality." "The calm here in Venezuela is never quite that calm. When you're living with hyperinflation, when you're living with certain shortages, problems with public transport and the effects of a five-year recession and US sanctions, daily life is never quite calm; it's always a little bit difficult. But in terms of how the media are portraying the current political crisis in Venezuela, we've seen very few day-to-day effects or impact, I could say. It's worth pointing out that it's very much in the interests of those who are promoting this sort of attempted coup d'etat and this position against Venezuela to promote the idea that there is a civil war, that there is chaos, there are running street battles and so on — and this is just not the reality." Fears of a repeat play by Abrams were vindicated last Tuesday when Venezuelan authorities confiscated dozens of arms and ammunition boxes on a plane that flew from Miami, Florida, in the US to Arturo Michelena International Airport in Valencia, Sputnik reported. Who is Really With Guaido? 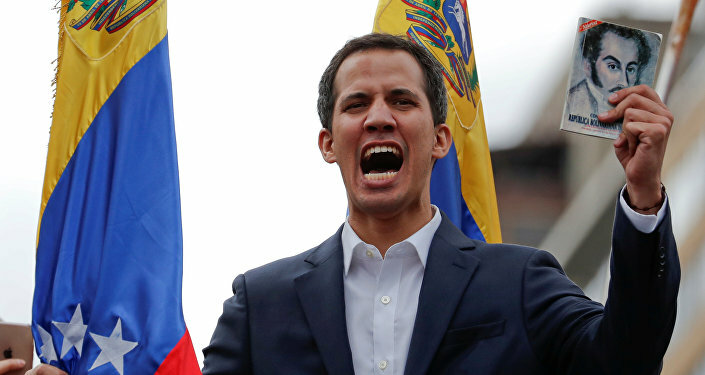 Dobson noted that "only 25 percent of the world's governments have actually recognized Juan Guaido, the man who is attempting to carry out a coup d'etat here. Ergo, 75 percent of the world is continuing to recognize the elected government of Nicolas Maduro. Now when you break this down by regions, you can see very clearly around 98 percent of Africa, 97 percent of Asia and something like 99 percent of the Middle East are all continuing normal diplomatic relations with the Venezuelan government. When you look at the regions of the Americas and Europe, only around 50 percent… have actually recognized Juan Guaido." "There definitely is contingency plans for the event of the US invasion, and obviously the Venezuelan people will attempt to defend themselves under any circumstances," Koerner said. "They are not going to tolerate a US intervention. But of course, fighting the wealthiest country in the world with the most advanced weaponry will, as Panama experienced in 1989, will have catastrophic consequences for the Venezuelan people."